Peep the plates packing in a bold punch. If there’s one thing we can all collectively agree on, it’s that warmer weather means endless hours of outdoor entertaining. And short of having to wait for the two (or so) months before we finally have the opportunity to do just that, we’re doing a little wishful thinking—also known as shopping, if you will. 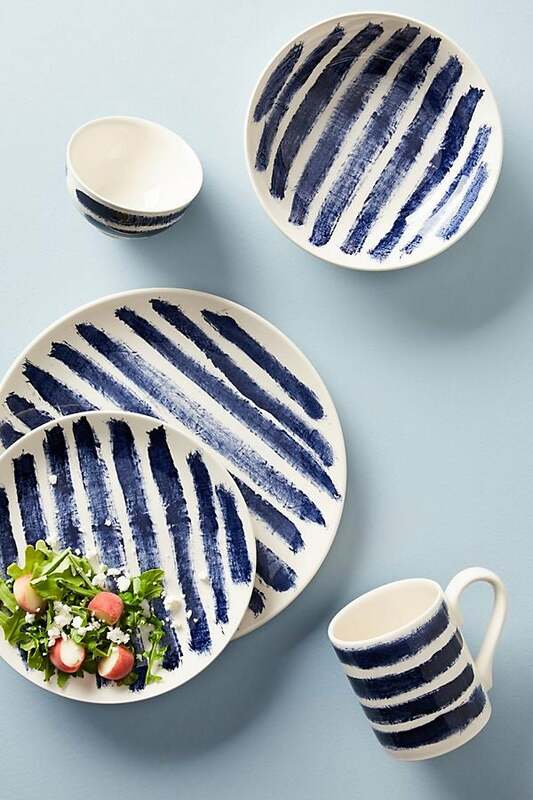 Looking at the latest trends in tabletop and dinnerware, we noticed one particularly prominent motif that reigned supreme: blue and white dishware. With that, we set out to find a few of our favorite items from our go-to shops, which managed to emulate the trend with effortless ease. Snoozy, monochrome plates? Consider them a thing of the past. Give your dinnerware the edge they deserve by rethinking the color scheme. Ahead, see the essentials we’re adding to our carts, each more vibrant and colorfully-charged than the next, with one hue in common: soothing blues. We’re suckers for a good brushstroke detail, especially when it comes by way of plating or dishware. This hand-decaled set boasts not only a beautiful color detail but also inspires with its streamlined composition that skews towards the elegant. This hand-painted ceramic plate may lean more towards the artful than the utilitarian but we’re all for elevating our current dinnerware situation. Channeling the work of artist Sol Lewitt, this two-tone set is a serious masterpiece. For the minimalists at heart, an opportunity to embrace the look by way of a subtle color detail that still upholds the trend. Pair this one with table linens of a complementary hue (think oranges or yellows) to make the look pop altogether. Hand-thrown and glazed, this mini side plate beautifully embodies the less-is-more aesthetic, with a playfully charming motif that exudes effortless cool. For those who are feeling up to the challenge of embracing the trend with a twist, look no further. We’re no strangers to Seletti’s avant-garde approach to home decor, and this graphic take on the dining essential is simply proof. Who doesn’t love a good speckled detail, especially when it comes in such a fresh colorway? This playfully vibrant enamel dish is not only durable and affordable but, it will also bring about a major dose of style to your dinnerware rotation. We love the fact that this one takes an inverse approach to the trend by adopting a bold backdrop and letting the white detailing take the back seat. Reminiscent of the night sky, this navy and gold plate upholds an ever-so-slightest touch of glam. Aside from its seriously low price point and eye-catching finish, we love this find for its sheer element of versatility, coupled with the fact that it makes for the ultimate medium for a mix-and-match situation.